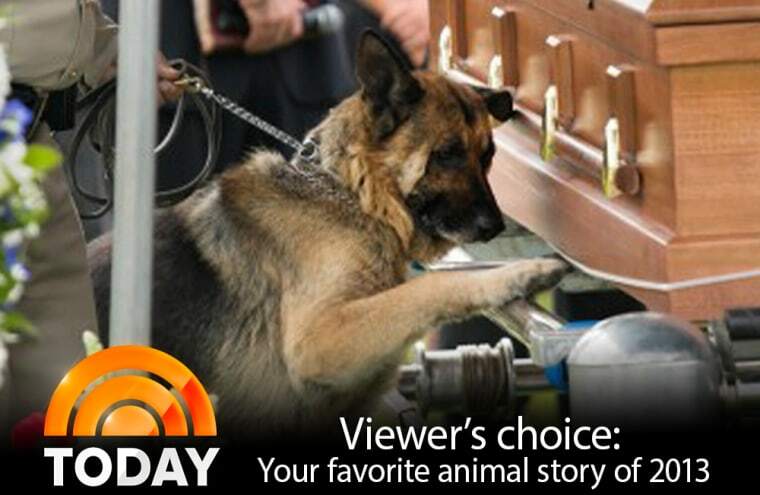 Update: After an overwhelming vote, TODAY.com's top animal story of 2013 is the touching story of a K-9 named Figo putting a paw on the casket to mourn his partner, Kentucky police officer Jason Ellis, who was killed in a suspected ambush. This story was originally published Dec. 27, 2013. Voting is now closed. This year has seen its fair share of incredible (and incredibly cute) animal stories, from a paralyzed pig with a wheelchair to a lioness who shares a heartwarming bond with a pair of conservationists. Here are the 10 animal stories you liked most on Facebook. Vote for your favorite, which we'll share later in the week. May 2014 bring us many more remarkable animal tales to share! 1. Kentucky police officer Jason Ellis was killed in a suspected ambush over the weekend. At his funeral, his K-9 partner, Figo, honored him, laying a paw on his coffin. 2. A photo of two shelter puppies cuddling went viral, as the story of the siblings -- one of whom is blind, and the other who guides his brother -- warmed hearts. They now have a home. 3. Ray Charles, a blind golden retriever, became an instant Internet star after his owner created a Facebook page for him. 4. Five-year-old pit bull Elle's efforts as a school therapy dog earned her the honor of being named the 2013 American Hero Dog by the American Humane Association. 5. A lioness reunited with the two conservationists who saved her life after years apart. 6. An orphaned foal named Breeze snuggled up with a teddy bear at The Mare and Foal Sanctuary in Newton Abbot, Devon, England. 8. Lun Lun the giant panda gave birth to twins, the first giant panda twins to be born in the United States since 1987, at Zoo Atlanta. 9. A lesson in patience? A man in Kentucky takes his pet tortoise on a (very slow) stroll twice per week. It takes them three hours to go 10 blocks. 10. This little paralyzed piggy gets a wheelchair — and becomes a viral sensation.